During gamescom, Blizzard announced the next expansion for Warcraft. Forgoing heavy armor, Demon Hunters capitalize on speed, closing the distance quickly to sever enemies with one-handed weapons. However, Illidari must also use their agility defensively to ensure that battles end favorably. They can command chaotic energies to inflict havoc on enemies, or they can focus their powers to resist damage and fuel vengeful attacks. 36 artifacts, one for each specialization. Depending on class/spec, it'll heavily affect your experience. Begin with adventure in Legion by seeking out your own particular Artifact; different experience for each. Earn Artifact Power as you adventure. Spend AP to unlock traits. Customize your weapon both mechanically and visually. Each artifact has a trait tree. Choose what you work toward when. Each Class bands together to face the Legion, and you are their leader. 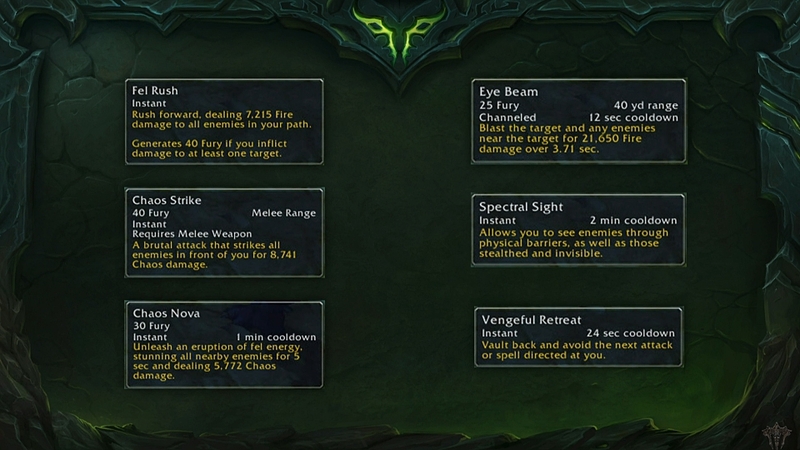 One of the central themes of Legion is to make classes have a much more distinct identity. Base of operations; a shared space for an entire class. Establishing the Order Hall is the second thing you do after getting your Artifact. An evolution of the Draenor system. Fewer followers, but more meaningful; not "raising an army". More world integration/interaction. Enable you to do more instead of doing it themselves. Ex: Scouting mission could discover a lair for you to visit, or give you a bonus when you're in an area. More dungeons, more replayability; keep doing dungeons throughout the expansion. Halls of Valor - Level-up dungeon in the clouds above stormheim; Valhalla inspired. Black Rook Hold - Ancient elven fortress in Val’Sharah; ancestral home of Lord Kur’talos Ravencrest. Vault of the Wardens - Return to the Demon Hunter prison; Warden maximum-security facility. Begin the hunt for Illidan. Visually notable for their horn, tattoos. skin texture and eyewear. Unique starting experience, much like the Death Knight. Start at a high level so you can jump into Legion content. Awoken from the Vault of the Wardens; desperate for help from Demon Hunters against the Legion. Build up Demonic Fury with a few abilities, and expend it to cast others. Dial back the effect gear has in PVP. A new PVP talent system. That concludes today's presentation! As mentioned at the end of the stream, the Legion beta is coming later this year! For more info, check out Wowhead's detailed Legion Announcement post.